Uncle Bill's Pet Centers. 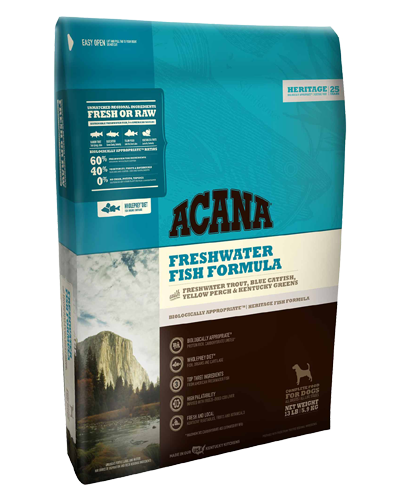 Acana Heritage Grain Free Freshwater Fish - 25 lb. At Uncle Bill’s Pet Center, we not only offer Acana dog food for sale, we also employ a highly trained staff that can assist you in finding an appropriate formula. By nature, all dogs are evolved as carnivores, biologically adapted for a diet rich and varied in fresh meats with smaller amounts of fruits, vegetables and grasses. That’s why they loaded ACANA Freshwater Fish with Rainbow trout from Idaho, whole Blue catfish from Kentucky, and wild Yellow perch from the Great Lakes – all delivered in nourishing WholePrey™ ratios. We will be glad to work with you to ensure that you feed your dog quality food for optimal health and happiness by providing the best selection and value on premium dog food for sale in Indiana. 4.50 lbs. 13.00 lbs. 25.00 lbs.